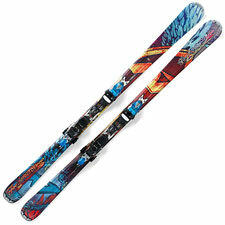 Nordica's Fire Arrow 80 Pro was one of the most popular skis at this year's SIA demo. I waited diligently for a chance to ride the updated Fire Arrow, and I'm glad I did. This is a significantly improved ski, taking last year's Fire Arrow 80 and giving it a much-needed jolt of energy. For a quick refresher, I thought the original Fire Arrow was interesting but just a bit too sluggish; it lacked liveliness. The Pro shares the same dimensions and sidecut radius as its predecessor, but adds a big grin-on-your-face kick in the tail that rockets you out of the turn. Quickness with the Fire Arrow 80 Pro is much improved as well, now placing it among the best in its class. No wonder the ski was so popular—with this much kick, you get quite an active and fun ride, offering more than enough zip to satisfy your Frontside carving needs. As with the original Fire Arrow, there is a great deal of area in the tip to contend with. Originally I think Nordica conceived of this as a sort of sidecut-based All Mountain approach, to boost the ski's running area. But today's All Mountain skis are ruled by rocker, not sidecut, so really the Fire Arrow's design is all about turn radius—creating tight, effortless arcs underfoot. The downside of the concept is a tip that does require some minding. Those great big tips can stick in soft snow when you lay the ski over, and they absolutely take some getting used to. To me, the Fire Arrow 80 Pro feels slightly unbalanced, necessitating some technique adaptation to stay away from the front of the ski. Interestingly, the ski makes a very favorable impression regardless. Stay centered and lay the Fire Arrow Pro over, and you get a positively thrilling turn with a big kick in the end. As a matter of taste, some experts will prefer to do more of the work themselves (and thus may find themselves at odds with all that sidecut), but most skiers will probably just find the ride exhilarating. Certainly, this is a quirky ski. The Fire Arrow 80 Pro remains unconventional and thus different from what you're probably used to. But in today's ski universe, fun matters perhaps above all else, and the Fire Arrow scores big in that category. For that reason, I would have to rate this as one of the most notable high-end carvers available today.